If a business prohibits guns but I ignore their policy and carry anyway and get caught for one reason or another what is the worst that could happen? Let us assume you ignore a gun free zone sign or request and you carry anyway. While on that property you find yourself in a deadly encounter and have to defend yourself. What now? The governing body will charge you with specific charges for specific crimes. Meaning, that if your use of deadly force was justified then it was justified. The fact that you were not supposed to have a firearm there, to begin with, doesn't have any bearing on determining if your use of force was legally justified. So you might be charged with breaking a law (if there is one) relating to having a gun where you should not BUT you aren't now somehow guilty of murder because you ignored the no gun sign. One infraction is not related to or doesn't affect the other. 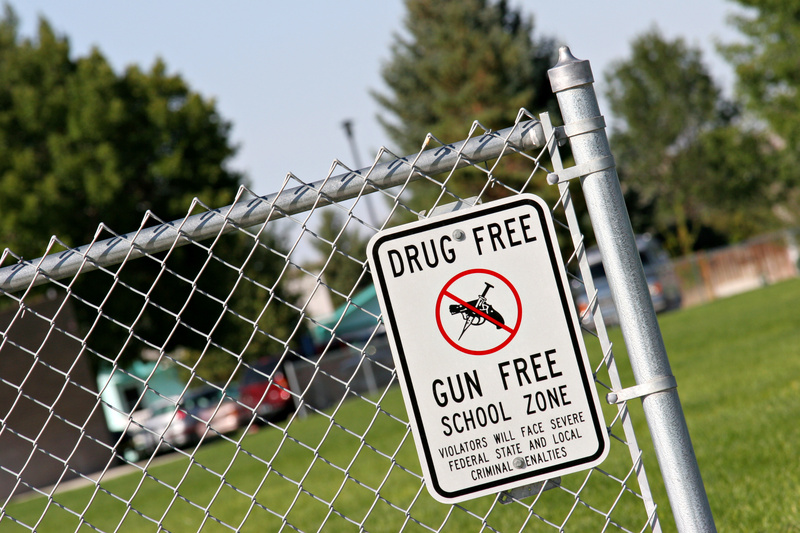 Some “Gun Free Zones” are government buildings or legally outlined restrictions. Meaning that there is an actual law on the books that says you can't take a gun somewhere. The federal government, for example, doesn't permit firearms inside any federal building. If you ignore that restriction and take your firearm into the post office (a federal building) and are caught the potential consequences are very serious. It is a felony to break federal law. Being convicted of a felony means you can't vote anymore, can't own guns, and will have a very awkward permanent stain on your next new-hire background check. Similarly, if your state restricts firearms in State, County, or City buildings and you ignore those restrictions; there is absolutely no doubt whatsoever that you have broken a law and if convicted will have legal consequences. Those consequences will likely vary from jurisdiction to jurisdiction. Might be a low-end misdemeanor or it could be significantly more serious. So that leaves private property. Everything from your home, to your workplace, the shopping mall, bank, movie theater and more. (See a list here of national chains that have no gun policies) Anything not owned by taxpayers. Being a property owner in America is awesome … and frankly the ability to own property is part of what makes America America. Property owners reserve a lot of different rights and among those is the right to be able to restrict firearms on their property. Now despite that, I hear gun carriers and websites classify different states based on if no gun signs have “the force of law” in that state. Four BIG CONCERNS jump out at me about that idea. 1: First, certainly if there is no law on the book in your jurisdiction that specifically allows property owners to restrict guns or if there is nothing in the law that explicitly protects that right of the gun owner one might come to the conclusion that signs in that state don't carry the force of law and that could be true. However, remember that in addition to statutes, case law also impacts the reality. There are some states where one can only conclude the truth by looking at past court decisions. If a no gun sign carries the “force of law” then your potential consequence could be outlined in the law (perhaps it states specifically that to ignore the sign is a class a misdemeanor) or you are simply outside the boundaries of the concealed carry law or statute that otherwise allows you to have the gun to begin with, and could therefore, be charged with the illegal carrying of a concealed weapon. If the owner has asked that people with guns do not come onto their property and you disregard that request (purposefully or by ignorance) I think it could be argued that you were not invited or privileged to be there and thus you could be charged with trespassing. If your presence with the gun causes a scene or creates a disruption you could be charged with disturbing the peace as well. 4: Nothing prevents a private property owner from pressing charges and trying to collect damages in the form of financial compensation. So while the sign may not carry “the force of law” that would be necessary to charge you with a crime; you may have to defend yourself in civil court against allegations that your actions harmed the business or the property owner in some way. If you choose to ignore firearm restrictions at government buildings you stand to face criminal prosecution. If you ignore signs at private property there are a myriad of potential consequences depending on the state and that state's laws and court precedents but even where there are no concerns on the surface; there are still other risks that you incur when you choose to take your gun into a place where the owner has actively requested you do not bring guns. For me, I choose wherever practical and possible not to frequent businesses that have communicated they don't want guns on their property for a few reasons. First, I don't want to deal with the sometimes confusing laws relating to “force of law” or the risk of other potential legal or civil consequences. Second, I don't want to give my money or patronage to a business that has communicated they don't respect my right to defend myself. There are almost always alternative, competing businesses, who do respect my right and provide comparable products or services. How about you? Let us know in the comments below how you choose to deal with gun free zones. 11 Responses to Caught Armed In A Gun Free Zone – Whats The Worst That Could Happen? I have argued with other “gun gurus” that it is important we educate people NOT to argue validity of signs or verbal requests. If someone (a property owner or other authorized official) Realizes you are carrying a firearm or you needed to use it and asks you to leave — just GO. if you argue a sign is invalid or unconstitutional you (by arguing) IMMEDIATELY meet the definition of a higher misdemeanor or, in some states, felony. Bottom line – don’t argue on site. Leave immediately. If you want to argue legality, do it in court, not on site. Some movie theaters in our city have the Requisite Circle w/Gun sign. Looks official but I wondered if was just talk or was it Law. So I looked at the very small fine print at the bottom. I looked it up in State Code. SO – You might want to read the fine print and look it up. Pls refrain from giving legal advice unless you are licensed and qualified to do so. (And no, “graduate and certified instructor in some random law of self defense” course does not qualify you to dispense legal advice… a Juris Doctorate and being a member in good standing with a state bat association does). So, those JD’s would only be able to legitimately give advice on bats or something? Please, you arrogant J.D. I’ll take my advice from Concealed Carry any day over that of a lawyer. I could ask questions of 10 lawyers and would get 10 different answers. And the accurate advice from Concealed Carry is free. I’d have to pay one of you folks $200 or $300 an hour to provide me with an answer that might be right, might be wrong, might be somewhere in the middle. Take a chill pill. Carrying a firearm where signage “prohibits” doing so will normally only become an issue if you handle, use, or inadvertently display the gun. The operative word in all this should be “concealed”. It’s like an insurance policy betting that you will never use it. If the gun is worn/holstered and kept hidden, then – – short of you taking action to immediately defend your family – – it will never be known. Properly carried, the chances of detection are probably even less than for you to ever have to use the firearm. I just won’t spend my money at any restaurant that puts up a no gun sign . I prefer to go across the street where no sign is posted . So if a business don’t want my money , I am ok with that . Businesses who are anti gun think about the business they lose every year . If two people come into a restaurant, order two meals $20 each plus his wife has 3 wines with her dinner and I have a Dr Pepper . Plus I always give a 20% tip because most waitresses barely make any money per hour . Just two people and a tip could be a $100 bill . Now if I like that restaurant and come once month . This restaurant is out of $1200 a year . This is money they lose because they turn down one gun owner , who legally is carrying a gun . We have over 300 million guns in the United States. We have 330 Million Americans living in the United States of America. This 300 million guns was before Obama was President. I am sure we have a lot more guns now . Because when Obama was President, my NRA Magazine said Obama was the greatest gun salesman in America. So let’s say a business loses $1200 a year from one couple . So just about everyone has a gun , including Liberals. Even Liberals carry guns . So if they got a CCW , and can’t come to your restaurant because of a no gun sign . Your cutting your business out of 50-60% of the business you could be bring in to your business. Not to mention the money you lose to expand your business. So as long as your anti-gun your hurt yourself, and also you hurt your employees . Because they lose a lot of money every year too ! This anti gun and Politics is ruining this country. It hurt both Liberal and Conservative businesses. Our country was much better off when everyone mind their own business. It would be nice if we can get back to the days when everyone was a lot more friendly. I do the same as you and I choose not to shop at those stores or eat at those places. Simply as you stated there are plenty of other competing businesses out there. What I see in the no gun signs is ” hey criminal I have gotten rid of the guns so come rob us.